In Paz’s romanticized view, a sense of death is an integral part of the national psyche, and Mexicans are good humored in the face of its inevitability. A skeleton is as Mexican as Uncle Sam is American. Yet Paz was certainly right to claim that daily Mexican life abounds in images of death. Churches house gory crucifixes, newspaper editors splash photos of bloody murder scenes across their front pages, and there is even the notorious cult of La Santa Muerte, where followers appeal to death as a divine entity. The most striking representations of death are found in the annual festival of the Day of the Dead, when offerings are made to the departed. It is a practice that dates back to the Aztecs, who observed a month-long celebration dedicated to the dead. So why did death become an important symbol in Mexican culture? There are four main reasons. The first is based in the religious beliefs of pre-Conquest Mexico. In the Aztec creation story, it was only through the sacrifice of the Gods that the earth was born. Human sacrifice was in turn necessary to maintain the life of the sun. Representations of the suffering Christ in Spain were particularly graphic, and there was a fascination with the “death as leveler” motif, which reminded people that eventually we all face death, regardless of social status. The theme was carried into Mexican culture, and can be seen in the figure of La Catrina, the skeleton dressed as a bourgeois lady. The character was first created by the Mexican illustrator José Guadalupe Posada, and it continues the leveler motif, because death has found even this rich, elegantly dressed woman. 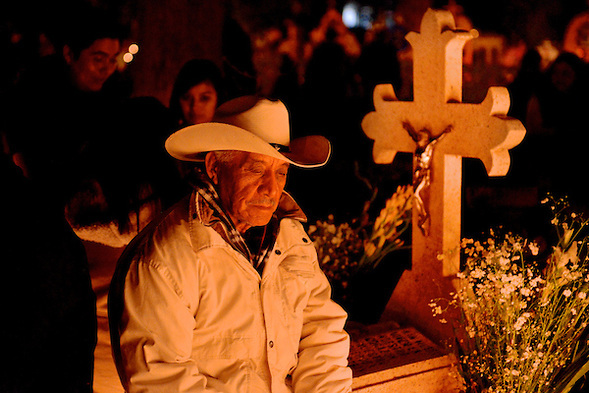 Mexican experience forms the third reason for death’s symbolic role in the country. Attitudes inherited from the Aztec and the Spanish were sustained by centuries of death invading life, beginning with the conquest, when disease and war decimated the population to one-seventh of its size. Later, despite the country establishing itself at independence as a large country that might even expand, it was also the first modern nation state to suffer an early death at the hands of foreign powers, primarily the United States, who executed the “second conquest” of 1848, during which Mexico gave up all of Texas, New Mexico, Arizona, Utah, California, and Nevada as well as parts of Colorado, Wyoming, Oklahoma, and Kansas. The final and most important reason for the adoption of this peculiar national symbol was the search for Mexican identity that followed the turmoil of the Revolution of 1910-1920. Following this bloody civil war, and particularly following the formation of the Institutional Revolutionary Party (PRI) in 1929, the concept of mexicanidad, a uniquely Mexican identity, became semi-official doctrine. The doctrine was adopted by the revolutionary government, who by this point were already moving away from radicalism and towards protecting established interests. It was in this context that the death symbol became an important part of government propaganda, with numerous revolutionary intellectuals tackling the theme and with the ruling party encouraging Day of the Dead festivities up and down the country. The Day of the Dead festival in Pátzcuaro, Michoacán takes place on Isla Janitzio. At night it is lit by thousands of candles. Death was a convenient emblem, itself a mestizo, combining both the Aztec and the Spanish. It represented an authentic Mexican identity that corresponded well with government doctrine; death was to be promoted, because there was nothing more revolutionary. What better reminder is there that we’re all equal in the end? In recent years, death has recovered as a radical emblem, but this time, it’s not the government who has taken it up. Every year, the Day of the Dead festival sees campaigners protesting migrant deaths along the border, and altars are dedicated to the victims of the drug war and gender violence. Last year, a storm of online protest forced Disney to drop its attempts to trademark the term “Día de Muertos” for merchandising purposes. The company’s planned 2016 film centered around the festival remains untitled. So the Day of the Dead retains its macabre vitality, despite efforts to co-opt it. Since being promoted by the state, its power as a symbol has taken on a life of its own. A still from Sergei Eisenstein’s Que Viva Mexico! This entry was posted in Culture and tagged Claudio Lomnitz, Day of the Dead, Mexican culture, Mexico, Mexico City, Octavio Paz. Bookmark the permalink.